Encore Stone Products manufactures 100% recycled, environmentally friendly stone products for residential and commercial applications throughout the Southeast. Our company turns granite scrap into beautiful Granite Pavers and Fire Pits. All Encore Stone Products are made from 100% recycled post-industrial discards from local countertop manufacturers, keeping thousands of tons of material out of landfills. All byproducts from the production of Encore Stone Products are ground into aggregate for use in roadbeds, making us a zero-waste production facility. What we create are improved products. Encore Stone's pavers are ideal for low impact developments as a recycled alternative to traditional pavers, because our recycled granite is four times stronger than concrete pavers, making it more durable and long lasting. Also, their color will not fade. Encore Stone Products qualify for the U.S. Green Building Council in Leadership in Energy and Environmental Design (LEED) credits for multiple categories and points. This is becoming the industry standard for not only commercial structures, but residential homes as well. Encore Stone Products has manufactured 100% recycled, environmentally friendly stone products for residential and commercial applications throughout the Southeast since 2011. Our company turns granite scrap into beautiful recycled granite pavers, tiles, backsplash and fire pits. All byproducts from the production of Encore Stone Products are ground into aggregate for use in roadbeds, making us a zero-waste production facility. Brett Maugeri is the founder and owner of Encore Stone Products, which he created after repeatedly watching the remains from his father's custom countertop company, Surface Crafters, being hauled off to the landfill at great cost to the company, month after month. Having worked in every sector of Surface Crafters and graduating from Rollins College with a degree in International Business, Brett researched the equipment he needed and found a powerful, patent-pending hydraulic system to stamp out his reusable Encore Stone products. 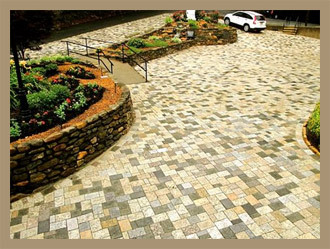 Encore Stone now saves millions of pounds of granite waste from going into landfills each year while also providing jobs with a 100% recycled American made product. When Encore Stone Products opened, it already qualified for the U.S. Green Building Council in Leadership in Energy and Environmental Design (LEED), with credits for multiple categories and points, the industry standard for not only commercial structures, but residential projects as well.